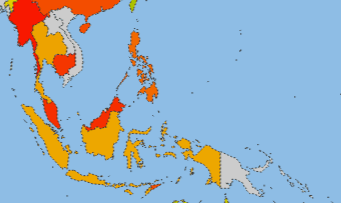 [/media-credit]There are a few countries in Southeast Asia region – Vietnam, Myanmar, Cambodia, Thailand, Lao PDR, Singapore, East Timor and Malaysia – that are falling behind in the global open data movement, while others – Indonesia and Philippines – are advancing as members of Open Government Partnership. So, how are these countries in Southeast Asia doing relatively to the rest of the world and with each other? Lack of capacity of government to maintain infrastructure and websites; incomplete and inaccessible published official information. Limited open data knowledge from the respective government officials. Limited capacity and open data knowledge of CSOs to take advantage or to ask for open data. In Malaysia, freedom of expression is lacking with very limited freedom of information, limited capacity for open data programs, and unclear government policies for open data. Data displayed in Open Government portal are incomplete and not in an open data format that supports open licensing. Despite having Freedom of Information Enactment (FOIE) in two states – Penang and Selangor – civil liberties and the public suffer from barriers of entry. Requests must be made in person when submitting a form on the counter with addition to steep request fees. Moreover, requests made via email are not accepted. The implementation quality of FOIE is lacking due to inadequate training among officers and awareness to the public. These challenges are exacerbated as the federal government is protected within the federal territory where the FOIE and FOIA does not exist. In contrast to Indonesia, the emergence of Open Government policy and FOIA in Philippines and Thailand have broadened their perspective on accessing and collecting valuable data in machine readable format with open licensing support. Having said that, there are no guarantees that FOIA in Indonesia ensures the public’s right to fully access official information due to the culture of secrecy inherited from the Soeharto era. For both Philippines and Thailand, having an open government portal does not guarantee the compatibility and the quality of data. This also is indicative of the readiness of government to share valuable data openly that could be used for both short and long term planning on grassroots developments across the country. In Singapore, there is no FOIA whereby information disclosure is regulated in a variety of informal and formal ways. The informal culture of secrecy inherited by the dominant People’s Action Party (PAP) drew public scrutiny and repression. Thus citizens are unable to enjoy their right of access to information. In Cambodia, there are no clear FOI provisions that currently exist in domestic law. Furthermore, the assertion of the Draft Law on access to information may conceal the government’s wrongdoings and limit access to information. As a result, these restrictions leads to very limited ability to build open data programs. Advocacy is lacking whilst sharing almost similar restrictions in FOI laws and FOE policies in Vietnam, East Timor, Lao PDR and Myanmar. Consequently, abuses of power continue to prevail when government is not open or accountable. Where do we measure the accessibility between decision makers and disenfranchised communities such as single parents, people with disabilities, elderly, youth and children? How can we show (and share) with the communities around the world about the reality of relationships and engagements between decision makers and disenfranchised communities? From budgeting to legislature to welfare, transparency and accountability are lacking. Official governmental websites have poor navigation for content, and often not up to date. With these difficulties, it is hard for CSOs to find valuable information that could measure the state of open data availability in their country. Global Open Data Index has becoming a very useful toolkit and international platform for CSOs to come together regionally in identifying data gaps and needs, and search common grounds to see how data can support their goals. However, at this point, it is uncertain to say at least there is impact for local communities. In the future, it would be useful and important to have localized data in promoting local governance accountability and transparency. Hopefully, the Global Open Data Index will also be a platform to support Sustainable Development Goals monitoring and will also inspire countries to develop their localised version of the Open Data Index.